Since 26/01/2019 in HD. Sometimes FTA. HDNational public television first channel. HRT, Hrvatska radiotelevizija. HDNational public television fourth channel. News program. HRTInt. since January 2019. Before HRT - HTV 5. HRT - HTV 5 since January 2018. HRT Int. since January 2019. National public television first channel. Radiotelevizija Slovenija. National public television third channel. 8 February 2018. Modulation, Symbol Rate and FEC change from DVB-S QPSK 27500 3/4 to DVB-S2 8PSK 30000 3/5. Private television channel owned by PRO. 24h January 2019. FEC changes from 5/6 to 2/3. Televiziunea Română Internaţional. Romanian International public channel. 1st April 2019. New transponder. Orange Slovensko. 28th August 2018. Symbol Rate changes from 6403 to 7500. • Free-to-air (FTA) are television (TV) and radio services broadcast in clear (unencrypted) form, allowing any person with the appropriate receiving equipment to receive the signal and view or listen to the content without requiring a subscription, other ongoing cost or one-off fee (e.g. Pay-per-view). • $ encrypted. Television encryption, often referred to as "scrambling", is encryption used to control access to pay television services, usually cable or satellite television services. For example. • Transponder 11130 V broadcasts 0 FTA TV channels and 7 encrypted TV channels (Antena1, Antena Stars, Antena3, Happy Channel, ZU TV, Antena International and Antena HD). 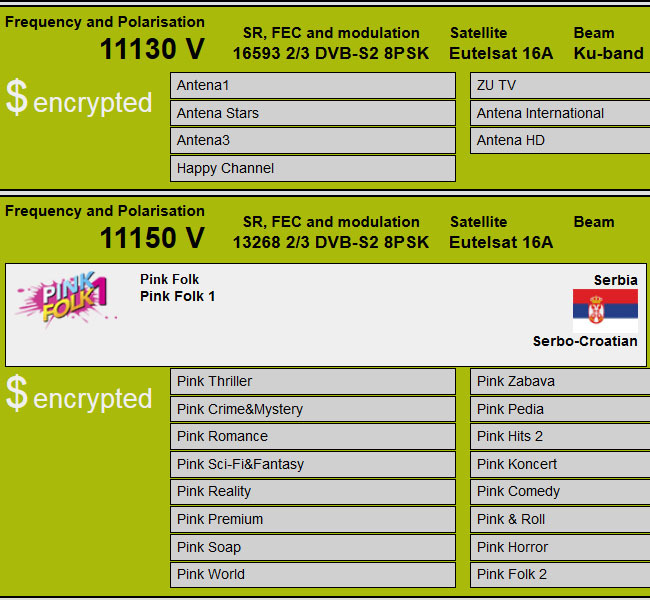 • Transponder 11150 V broadcasts 1 FTA TV channel (Pink Folk 1) and 16 encrypted TV channels (Pink Thriller, Pink Crime&Mystery, Pink Romance, Pink Sci-Fi&Fantasy, Pink Reality, Pink Premium, Pink Soap, Pink World, Pink Zabava, Pink Pedia, Pink Hits 2, Pink Koncert, Pink Comedy, Pink & Roll, Pink Horror, Pink Folk 2). I want to get all this channels frequencies and symbol rate as a installer. Eutelsat 16 A Pro Tv internazional Romania 11.303 Horizontal no corekt!!! hllp Swizerland Andermatt. Pro TV Internazional??? ?